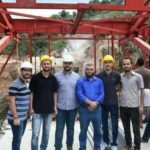 PHOTO: Engineering Georgia magazine Daniel Agramonte was among nine ASCE members featured in a recent issue of Engineering Georgia magazine for winning 2017 Georgia Engineering Foundation awards. Civil engineers are motivated by a lot more than shiny trophies and colorful ribbons. But that doesn’t mean a little recognition isn’t nice. 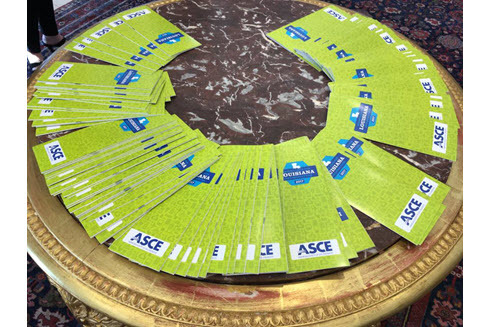 George Section President Shaukat Syed, M.ASCE, has been working to get as many of his members as possible recognized with awards and honors. 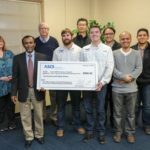 To that end, Syed made sure to nominate several Section standouts for 2017 Georgia Engineering Foundation Awards, and nine ASCE members won. “Shaukat has excelled beyond all expectations,” said Steven McCutcheon, Ph.D., P.E., D.WRE(Ret. ), F.EWRI, F.ASCE, himself a Lifetime Achievement Award winner in 2016. Each award winner was featured in the March/April 2017 issue of Engineering Georgia magazine. PHOTO: Louisiana Section The Louisiana Section recently released its Report Card for Louisiana’s Infrastructure. The product of more than 18 months of study by a team of more than 50 civil engineers, the Louisiana Section’s new 2017 Report Card for Louisiana’s Infrastructure arrives at the same overall grade for the state as the new 2017 Infrastructure Report Card does for the nation – a D+. Updating the findings of its first Report Card in 2012, the Section’s new report evaluates 11 major components of the state’s infrastructure. Explore the grades Louisiana infrastructure earned and read the complete report. PHOTO: University of Jordan Student Chapter Huda Al-Husainy inspires the University of Jordan students. 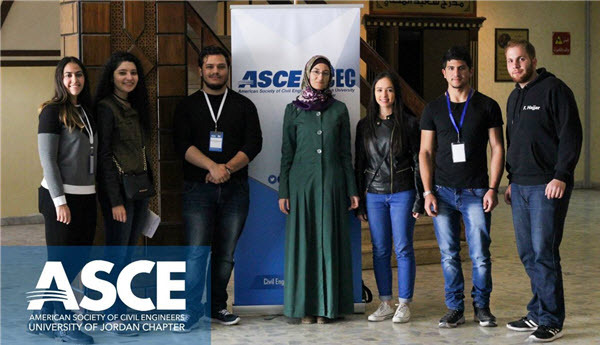 University of Jordan Student Chapter members were left feeling more empowered recently following a “success seminar” featuring a guest talk from a celebrated industrial engineer. Huda Al-Husainy, a graduate of nearby Hashemite University, works in Jordan Engineering Association training programs. Among her honors, last year she received the Silver Stevie Award for Women in Business. Al-Husainy spoke to the Student Chapter about overcoming adversity, finding the right job, and specific obstacles for women in engineering. Her message of hope and hard work inspired Student Chapter members. PHOTO: SB-R YMF The SB-R YMF bounce, rock, skate and roll. 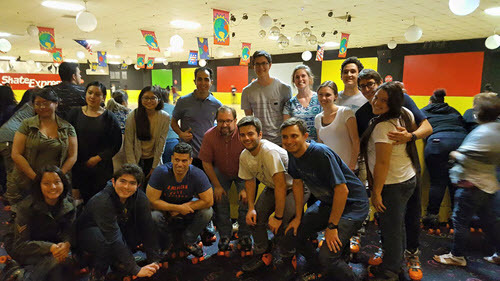 Members of the San-Bernardino-Riverside Branch YMF recently enjoyed some quality time together at the roller rink. Keep up with the group on Facebook. PHOTO: Lebanon Section The technical jury considers a popsicle bridge during a recent student competition hosted by the Lebanon Section. 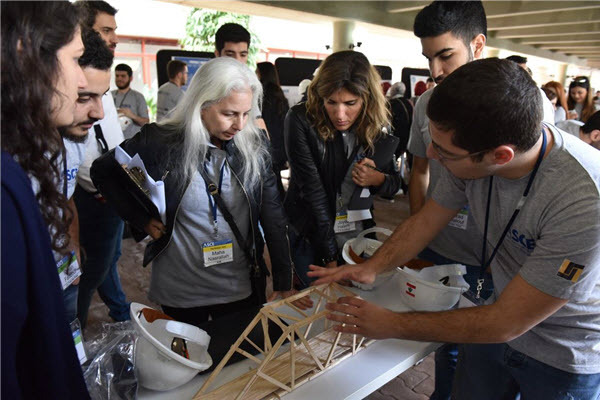 A recent popsicle stick bridge competition hosted by the Lebanon Section at the Lebanese American University’s Byblos campus helped widen students’ horizons. The field included 27 teams and 135 students from American University of Beirut, Beirut Arab University, Lebanese American University, Lebanese University, Manar Institute of Technology, Notre Dame University, Rafik Hariri University, Saint Joseph University, the Holy Spirit University of Kaslik, and University of Balamand. Notre Dame University won first place, followed by Lebanese American University and Lebanese University. 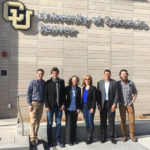 The full-day program also included several presentations from leading engineering companies, as students were able to learn and engage with professionals, connect with peers, and most importantly be exposed to innovation in bridge design and construction. PHOTO: Rutgers University At the site of a Linden, NJ, rain garden, Rutgers students, Prof. Qizhong Guo, and Phillips 66 Bayway Refinery officials join Mayor Derek Armstead. 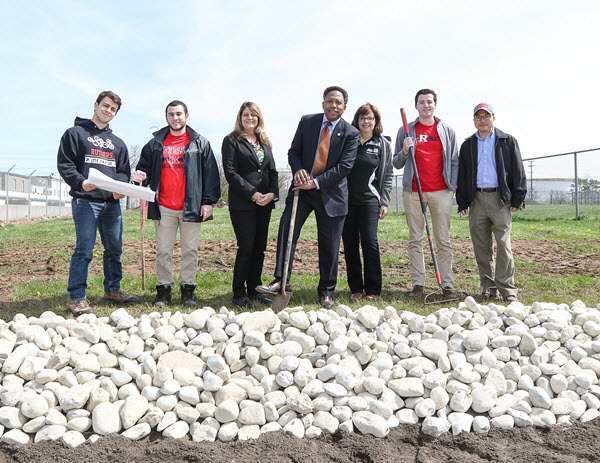 Members of the Rutgers University Student Chapter – led by professor and flood-mitigation expert Qizhong (George) Guo, Ph.D., P.E., D.WRE, M.ASCE – are working with faculty and students from the university’s school of engineering on a rain garden in nearby Linden, NJ. The rain garden will help control flooding in the Tremley Point neighborhood, while also restoring wetlands and improving the local ecosystem and recreational space. The Rutgers team is working with the Linden city engineer and a local consultant to design and construct the 50-foot by 40-foot garden, buoyed by a funding donation from Phillips 66 Bayway Refinery. “The project was conceived to help address flooding in a vulnerable working class community of approximately 275 homes located in an industrial area,” Guo said. 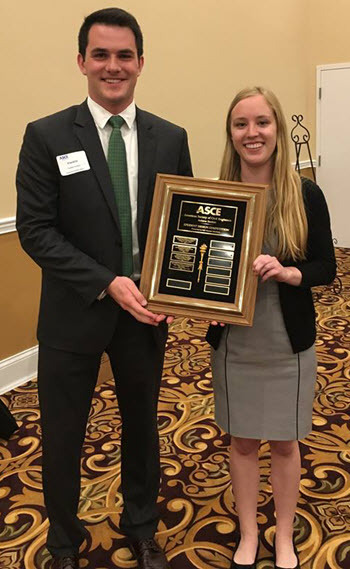 PHOTO: Notre Dame ASCE ASCE student members Frankie Forsberg and Savannah Washlesky took first place. 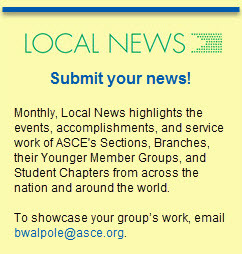 The Indiana Section hosted a student competition at its April meeting. Eight schools from around the state presented. Notre Dame University seniors Frankie Forsberg, S.M.ASCE, and Savannah Washlesky, S.M.ASCE, represented the Notre Dame Students Empowering through Engineering Development group, and their NDSEED bridge project in Las Pencas, Nicaragua won first place in the competition. 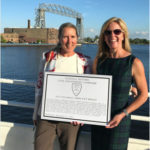 Read more about NDSEED’s winning project.